Need commercial pest control? Think Allison Pest Control! Allison Pest Control is one of the largest New Jersey pest control service firms serving Monmouth County, Ocean County, and Middlesex County. Our firm is family owned and operated and has been providing commercial pest control services in New Jersey since 1917. Our business focuses on courteous, customer satisfaction driven home pest control and commercial pest control services. With over 5,000 homes and businesses serviced annually by our fleet of professional pest control technicians, Allison Pest Control exterminators have seen and effectively treated for just about any pest that makes its home in New Jersey. When you want your pest problem solved fast, Allison Pest Control is the NJ Pest Control service company to call first! Bed bugs are a growing problem in New Jersey.Bed bugs are not only big news in our area, but a growing problem nationwide. With our close proximity to one of the nation’s top bed bug infestation hot spots (the New York City metro area), and with our locale being a vacation and travel destination for many, bed bugs are becoming a growing problem for residents and businesses in our area. What is problematic is that bed bugs now infest more than hotels in popular vacation destinations. College dormitories, airport luggage conveyors, and even business offices are all starting to see bed bug infestations. At Allison Pest Control, we provide effective treatment to quickly exterminate your bed bugs. We understand the stigma and psychological trauma that a bed bug infestation can cause. We work hard to discretely solve your bed bug problem. Although preparing for a bed bug treatment can be time consuming, we work hard to help you from initial diagnosis of a bed bug problem to final extermination. 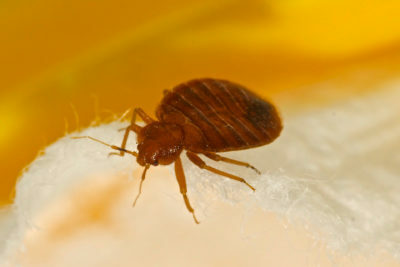 We have effective bed bug control options and will take the time to educate you on the situation and what preparation needs to be done before our pest control techs arrive. You’ll find us knowledgeable, sensitive to your concerns, and thorough. No office or business pest control problem is too big or too small for Allison Pest Control. We provide relief from annoying crickets, the scourge of ants, extermination of bed bugs, and comprehensive termite control. But that’s not all, we offer comprehensive pest coverage and pest management services for a wide range of ant varieties, difficult to treat bed bugs, biting insects, stinging insects, commercial pests, pantry pests, nuisance insects, problem insects, rodents, and wood destroying insects. Just call us at 800-564-4585 and we’ll come out and ID your pest free and offer a treatment estimate. With friendly, personable service, don’t you think it’s time to find out why over 5,000 other customers consider Allison Pest Control their local New Jersey pest professional of choice? Allison Pest Control provides comprehensive integrated pest management programs for commercial properties and businesses. We provide one-time or contracted services for businesses, office buildings, storage facilities, nursing homes, hospitals, municipalities, daycare centers, restaurants, hotels, motels, Home Owner Associations, apartment complexes, condominiums, and schools. We understand the complex needs of special facilities such as hospitals, physicians’ offices, nursing homes, and daycare centers. When you need unobtrusive pest problem resolution, we provide pest control services on your schedule that is focused on minimizing disruption to your business, daily operation, and appointments. With our emergency service you are guaranteed fast resolution to any pest need as it comes up, even after hours, on weekends, and holidays. Allison Pest Control provides the proactive pest control services that protect your facility and reputation. With the Allison Pest Control’s five-star pest control program you’ll get better service and benefits than with your old pest control company, guaranteed! With one of the largest pest control fleets operating in Monmouth and Ocean Counties, Allison Pest Control can provide the coverage you need for your multi-property requirements. Not only do we offer better rates but we offer fixed service fees for up to three years. Contact us today to find out more information about how Allison Pest Control can help you save money and solve your pest problems at the same time.